September 28 is the Feast day of St. Lorenzo Ruiz and companion martyrs. St. Lorenzo Ruiz, also known as San Lorenzo Ruiz de Manila, is the First Filipino Saint. He died as a martyr in Nagasaki at the age of 34. In 1636, accused of murdering a Spaniard, Ruiz boarded a ship carrying a group of missionaries to Formosa (Taiwan) and Japan. Ruiz accompanied his companions to Nagasaki, where Christians were being persecuted due to Japan’s wariness of foreign colonialism. According to accounts, the Japanese promised Ruiz that they would free him if he denounced Christianity. He refused, and was tortured and hanged upside down until he died. His martyrdom and a miracle attributed to his intervention led to his elevation into sainthood. Pope John Paul II beatified St. Lorenzo Ruiz in 1981 during his visit to the Philippines, and later canonized him as the Philippines’ first saint in 1987. 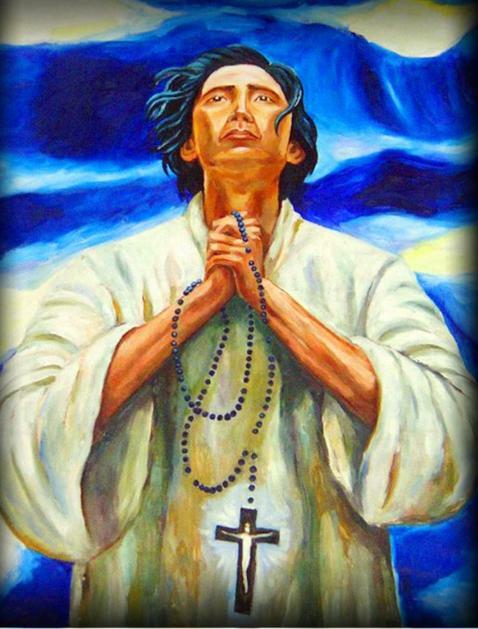 San Lorenzo Ruiz is recognized as the first Filipino Saint and Martyr.